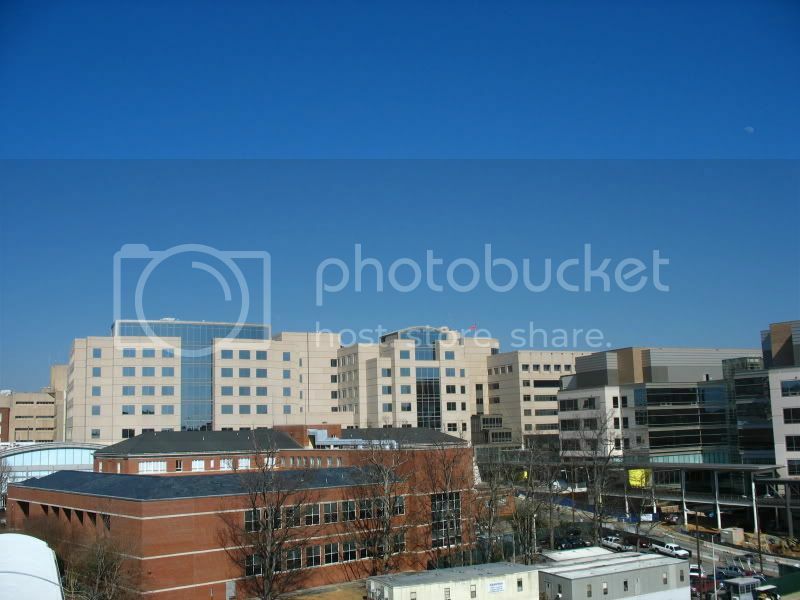 Last week I went to UNC in Chapel Hill, NC for my regular melanoma check-up. I checked out fine (no recurrences). I did a double take when I looked down at the group of hospitals. At first I couldn't tell what was different but was surprised to see there were still construction crews and work being done. 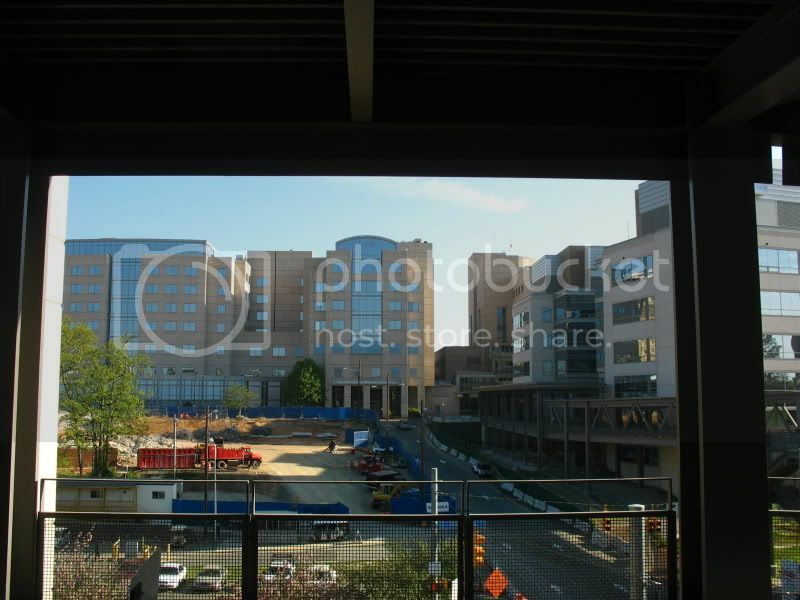 At my September appointment I went to the newly completed NC Cancer Hospital so I knew that was finished. The cancer hospital is the one on the right hand side of the shots above. As I got closer and closer it was obvious that something big was going on. Then all of the sudden it hit me, the Gravely Building was gone. 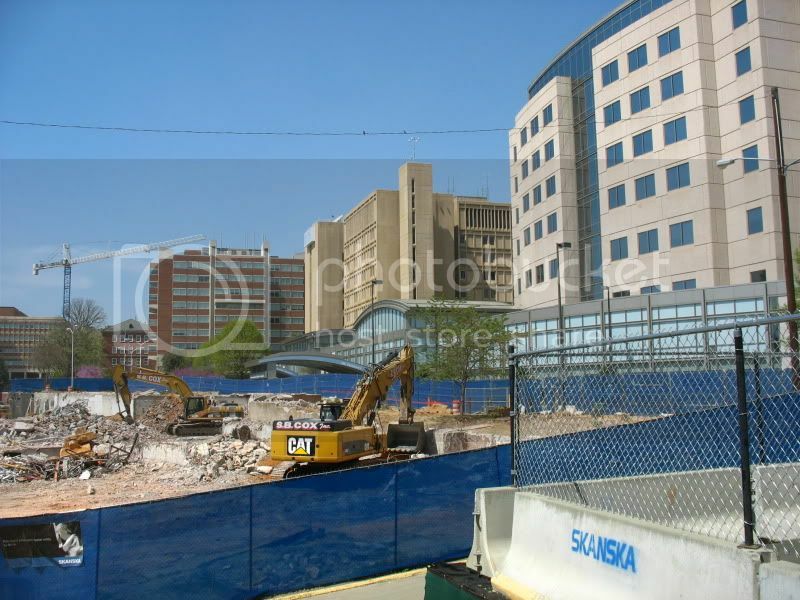 That's the building in the shot below from my old photos, and used to be where I went for oncology check ups. Turns out the 1950s building was deemed too expensive to renovate for another use so it was demolished after the Cancer hospital opened. 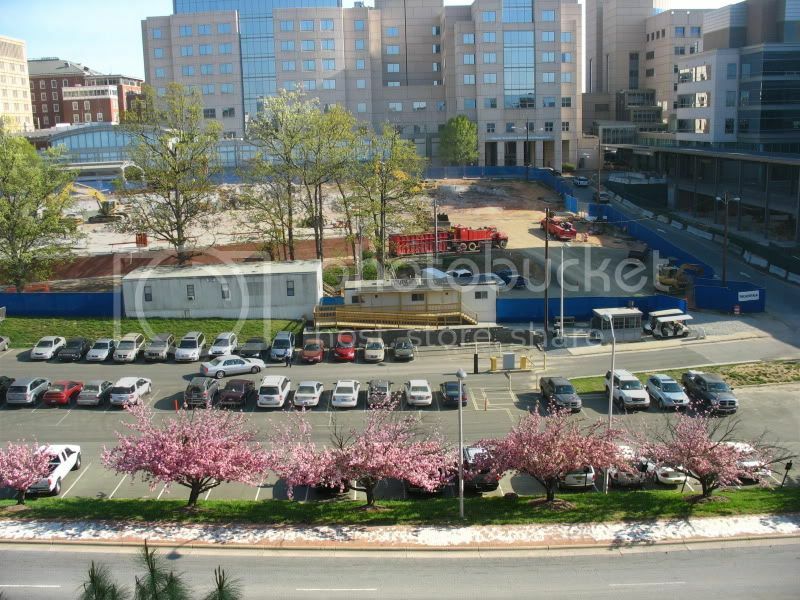 I looked online (link to article) and for now they are going to just grow grass there and improve the hospital entrance, until they can afford to put up a patient tower, as part of future expansion. After my appointment I went to the NC Botanical Garden which is across the highway from where I enter and exit to go to appointment at UNC. 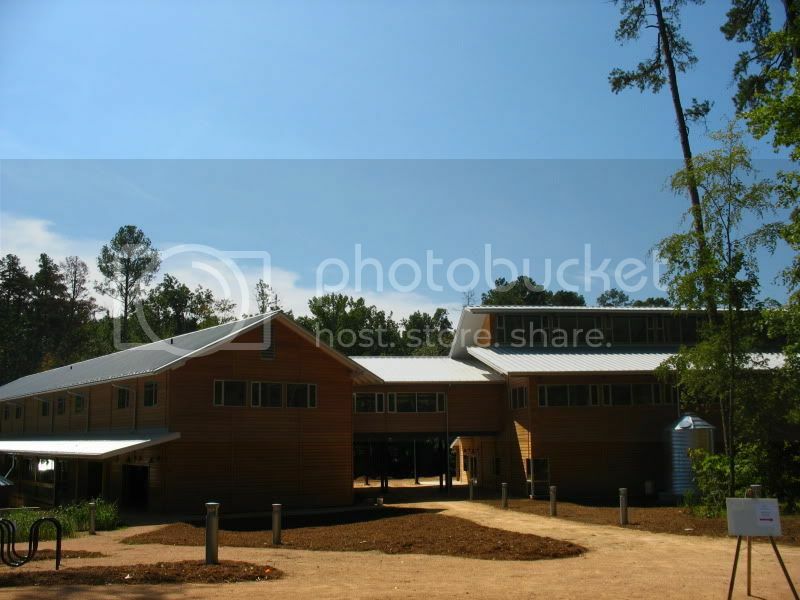 Below is a shot of the new Botanical Garden Educational center which was completed in October 2009 (shortly after the new Cancer hospital which was completed in September 2009). 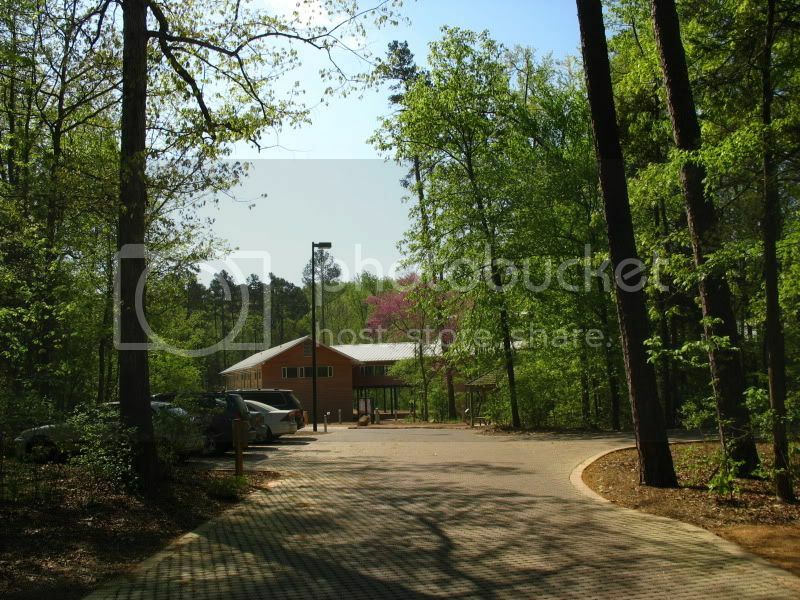 The 29,656 square foot education center was designed to minimize environmental impact. You can read more about the building at this link. The panels on the building provide at least 12 percent of its electricity and it has large cisterns for rainwater storage. The two shots above were taken last week. The shot below was one I took shortly before it opened in 2009 and you can see one of the cisterns on the right. I always enjoy going to the garden after appointments at the hospital, when I have time. The shots below are just a few of the many I took this past Thursday. Although it has been 5 years since my latest surgery to remove lymph nodes in the area where my melanoma spread, I always feel some tension when going to appointments, even routine ones. There is nothing like a photo walk to make me relax, and there is always so much to see at the botanical garden. For more posts from around the world, you can visit the home of That's My World Tuesday. So glad all went well with your tests! Cancer is one of the most scary things around, I think. Gras instead of a huge building is a nice idea, I think. 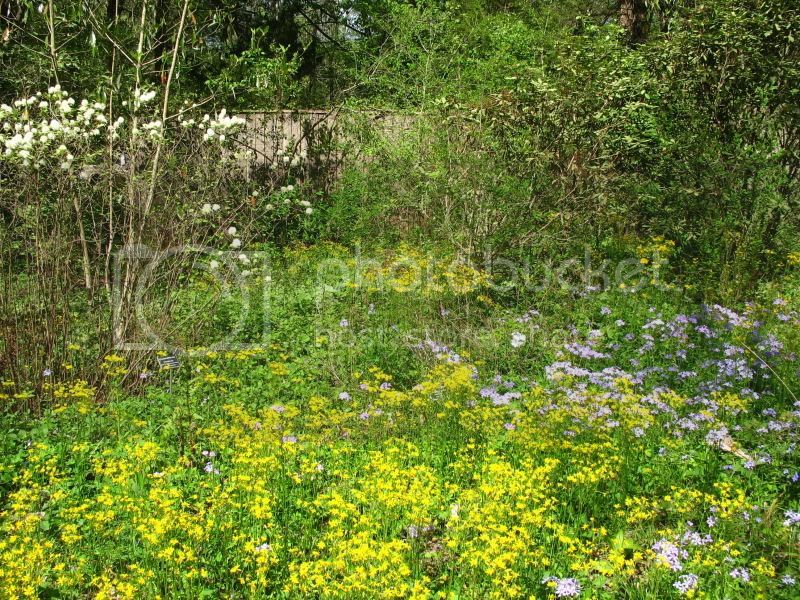 And the botanical garden really looks great to enjoy and relax the Beauty of nature! Beautiful collection of shots. I loved the nature shots most. It is sad that old building was demolished to make way for new ones. Hi Carver, these are all great shots. We spent the weekend, and will be there also most of this week, at North Abbot Cardiac ICU. Didn't think to take any photos, though there are a lot of interesting things going on in and around the area. I know what you mean about the appointment being tense when you are going back for a checkup. Ever worried they may find something else. :( So glad all is going well for you though and there is no reoccurance! It is great that there is a place near by for some tension releasing place to spend a little time. That is wonderful. Thanks so much for sharing - lots of hugs to you. I appreciate it. First of all, I'm so glad all went well with your check up! What great news! There sure are a lot of hospital buildings!! And of course, I love your taking us to the Botanic Garden! What a beautiful place and so peaceful! Looks like a great place to go at any time, but especially when one has news to celebrate as you did! Thanks for sharing the beauty and have a wonderful week, Carver!! The gardens look beautiful and I love the insect sculpture. So glad there were no reoccurances, Carver! 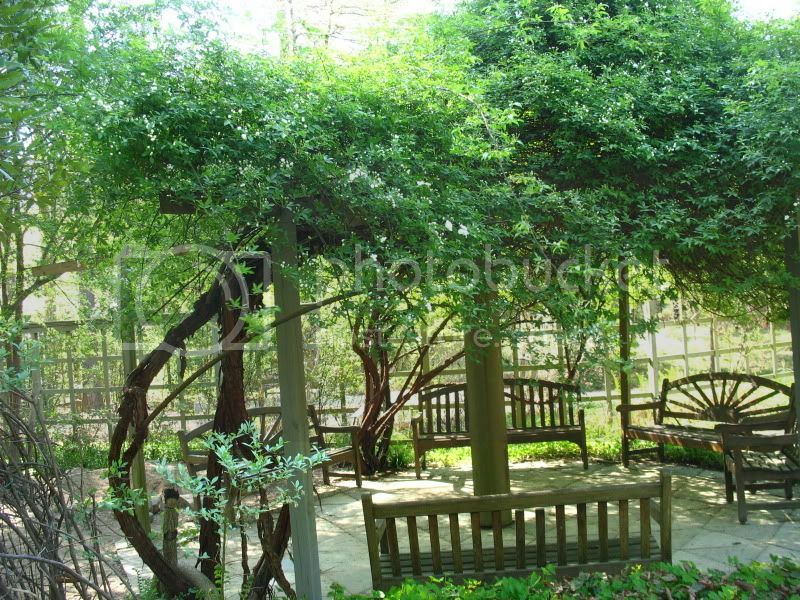 It must be very relaxing to be able to visit such a beautiful garden so close to the hospital. Carver: Neat look at all the construction. Looks like you had a great walk. Glad to hear all's well and you're cancer free (keep it up). I am always nervous when going to the doctor. My BP always shoots up when I'm sitting in the waiting room. Anyway, I work in a hospital and we have 3-4 wings that are due to come down in the coming years too. More expensive to retrofit than to build a new one, especially in earthquake country. I am so pleased to hear all is still well with you. The gardens are looking very pretty at this time of the year. Enjoy your week. I am so happy all went well with your test. The gardens looks like a beautiful place to visit, I love the sculpture. What a pity they demolished that beautiful old building. The botanical garden is beautiful and so peaceful. Really like that. Great, your tests went off well. You made good use of time with you there. :) The sculptures are amazing. Thanks for showing us your world. Hitting two birds with one stone. Views of the hospital and the gardens. 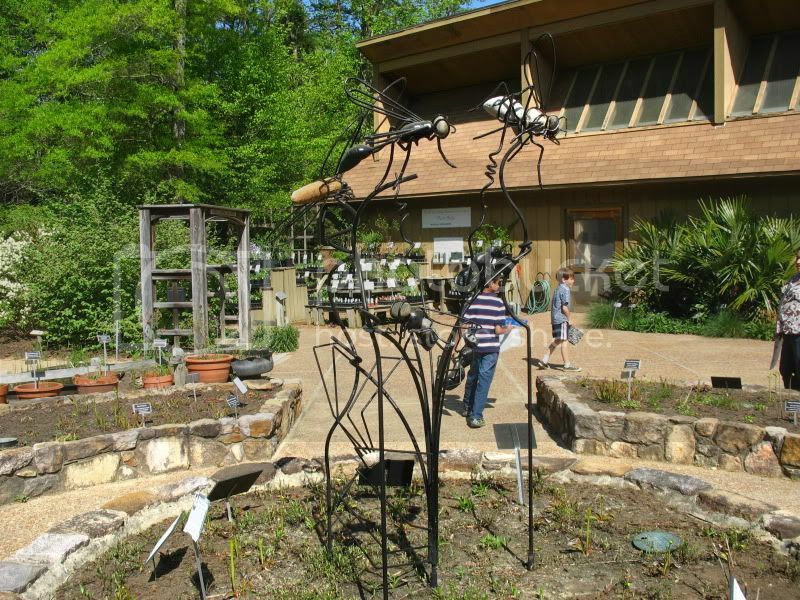 Love the bug sculptures and the wild flowers are just beautiful! Glad that tests went well! i know what you mean--i feel stressed everytime i need to see a doctor. 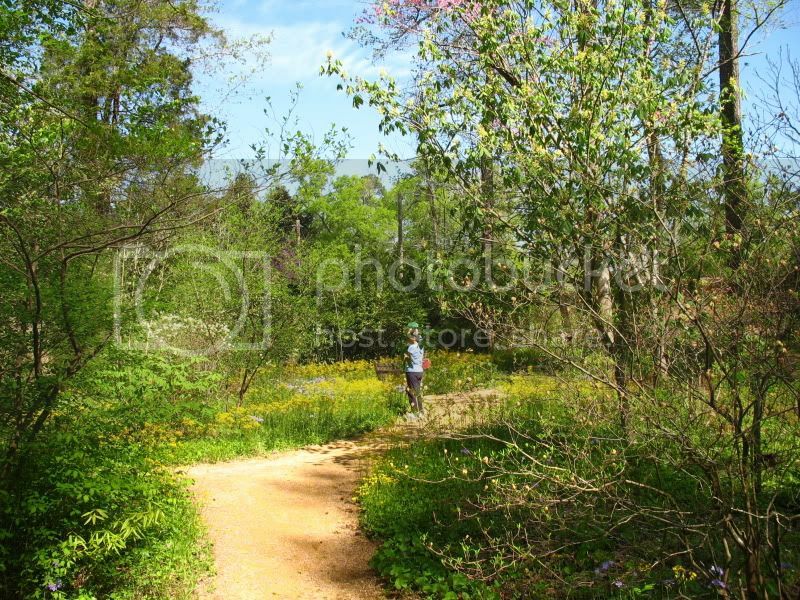 nature has a calming effect--i hope the walk in the Botanical Garden had helped you relax somehow. firstly, it's good to know that there're no recurrences in your cancer. I like old buildings and it's just sad to know that they can't retain it. Then again, it's probably wiser to have the grass than try to renovate it. Would definitely love walking around the garden. Great captures! The cancer hospitals look so much more friendly than the old ones. There is nothing better than to go to nature to give thanks for good news or to come to terms with not such good news. It makes my heart sing that you are clear again. Great to know you are doing fine. Btw i love those bees! A great tour, Carver. I work on a similar campus, and a building near my office is about to come down because it's less costly to do that than to let it stand, and much less costly than renovation to current standards for laboratories. I love the botanical gardens. I hope that being in nature brings some peace and relaxation after what must be a tense and scary check up.